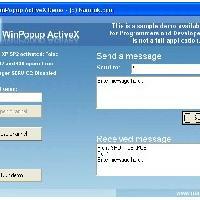 English Descriptions : WinPopup ActiveX solves the problem of exchange data between your applications on the local area network (or in local computer) without any server. Simple to use, it also manages the Windows XP firewall while letting you to add your application and your desired ports in the exception list of the firewall. 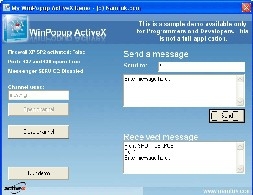 Compatible with Microsoft WinPopup, NETSend, My WinPopup Express, Linux Samba, this control enables you to create chat applications, messenger, or others quickly.